or for a consultation to discuss your requirements. David Lanigan has been playing various types of bagpipes (Scottish Highland bagpipes, Scottish smallpipes and Scottish Border bagpipes, shuttle pipes, and electronic pipes) for 34 years and has been influenced by the piping styles of Highland and Lowland Scotland, Ireland, Brittany, Galicia, and Cape Breton Island, Nova Scotia. A veteran of piping schools and workshops in British Columbia, Idaho, Oregon, Scotland, and Washington, David has studied with many of the world's top bagpipers. In 1996, David traveled to the Scottish Hebrides island of South Uist and took part in the first annual Ceòlas school, a reintegration of the music (bagpiping, fiddling, singing) and step dances of the Gaelic peoples of Scotland. Ceòlas also affirmed links between Scotland and Cape Breton Island in Canada. Other bagpiping schools that David has attended are the Balmoral School of Piping and Drumming, Coeur d'Alene Summer School of Piping and Drumming, and Western Academy of Pipe Music. David also has attended many Highland bagpipes weekend workshops presented by the Oregon Pipers' Society in Portland, Oregon, and the Simon Fraser University Pipe Band in Burnaby, British Columbia. 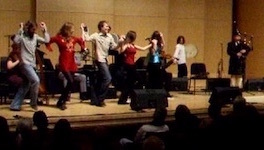 Favorites of David were the Seattle, Washington Lowland bagpipes workshops featuring Scottish players Anna Murray, Gordon Mooney, and Hamish Moore; and the music and culture workshops presented by Slighe nan Gàidheal. A highlight of David's concert performances was playing Scottish Highland bagpipes on stage with Ireland's ambassadors of folk music, The Chieftains, during one of their US tours. David played with the Desert Thistle Pipe Band of southeastern Washington for 25 years, nine of those years as Pipe Major. Early in his bagpiping career, David competed in the Pacific Northwest Highland games circuit, with stops in Athena and Portland, Oregon and Seattle, Spokane, and Tacoma, Washingtion. 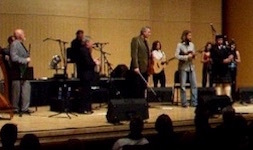 In 1999, David formed Celtic band Skweez The Weezle, in which he plays Scottish Border bagpipes and Scottish smallpipes, Irish bouzouki, octave mandolin, tenor mandola, dulcitar (a hybrid of Irish bouzouki and mountain dulcimer), and whistles (while occasionally getting in some tunes on the Scottish Highland bagpipes as well). This band is still going strong. In January, 2001, several of David's original compositions and arrangements for the bagpipes were published in Cape Breton bagpiper Barry Shears' tune book "The Gathering of the Clans Collection, Volume 2". In May, 2010, several of David's original compositions were published in Washington State bagpiper John Dally's tune book "The Northwest Collection of Music for the Scottish Highland Bagpipe."